I have no hesitation recommending this product. The sound quality is what you really buy these type of accessors for and this solution from iClever doesn’t disappoint. It is excellent across all types of music plus you have the added benefits of a great industrial design, splash resistance and long battery life. should you drop it. The BTS04 supports multiple Bluetooth profiles including A2DP, HFP, AVRCP and is Bluetooth 4.0 compatible. As the speaker supports A2DP, there is a built-in microphone so you could use this device as a speaker for phone calls with no problem. Looking at the BTS04 itself, it is designed to stand on its long edge as it has two rubberized feet to keep it from skidding on tables. The top edge is where you will find the controls for the speaker. This includes the power button, the Play/Pause button, the multi-functional Next/Volume + button and Previous/Volume – buttons and the phone answer/hang-up button. The front face of the speaker has a mesh-like design with the iClever logo in the center. Under this mesh is where you will find one of the 5w speakers while on the opposite side you will find the other. This design lends itself to better audio quality as you get more of a surround effect instead of the sound just blasting out of one side. 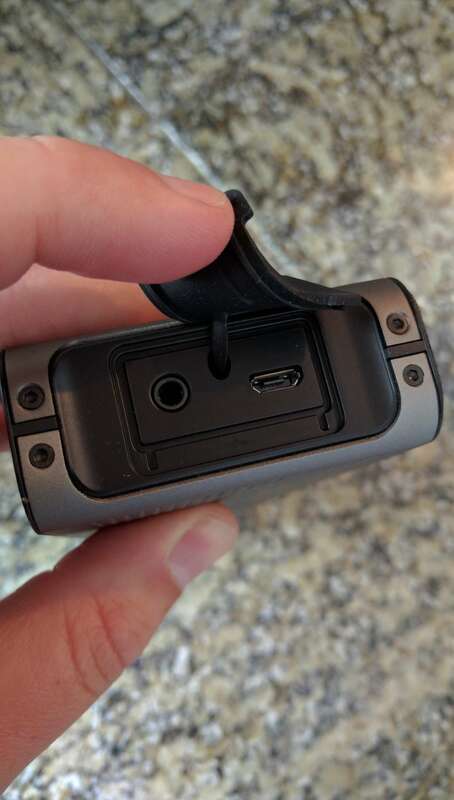 One the right edge of the speaker you will find a rubber cover that pulls of to expose the Micro-USB charging port for the speaker and a 3.5mm auxiliary port. If you have a device that doesn’t support Bluetooth (like an older iPod), you can use the auxiliary port and still use the speaker. The BTS04 has a IP rate of IPX5. This means that it can handle being splashed with water but not submerged. If you have the speaker near your pool, hot tub or shower, it should have no problem withstanding the occasional splash of water or water build up if it is outside. Battery life of the speaker is pegged at 10 hours on a full charge and I found in my testing that it was pretty much spot on. The good thing is if you plug it in to charge, you can use it at the same time. thing is, if it hasn’t been configured with a device already, it will automatically go into pairing mode and announce it is waiting for pairing. This is a big time saver and avoids confusion for users trying to figure out if the speaker is in pairing mode or not. On your device you are looking for IC-BTS04 to pair. Once your pairing is successful, you will get audio confirmation and you are set. Because of this automatic pairing mode, I personally think that iClever speaker is well ahead of other similar products. If there is one knock I have on the iClever BTC 04 it is the multi-function controls. The Next/Volume+ and Previous/Volume- buttons are combined. If you short press them, you will get the track function while if you long press them, you will get the volume control. That in itself isn’t so bad but the problem I’ve found is that when you long press, you turn the volume up or down too fast with no real way to control it gradually. I will admit over time I got a lot better at getting the “feel” right for volume control. I also found that it was easier just to control the volume from my phone or tablet than to use the buttons on the speaker for that control. Aside from this, the controls are easy and work well. Moving between tracks is easy as is the Pause/Play button. The audio quality from the BTS04 is outstanding. The challenge with may of these types of accessories is that you suffer either on the high end or the low end of sound. Either the treble is great and the bass is poor or the opposite. This speaker seems to have gotten around this by the design of having the speakers on opposite sides of the unit. That gives audio richness that front facing only speaker solutions struggle to achieve. Overall tone quality is very good in all ranges on all genre of music. I tested the speaker through a wide range of music types – Iron Maiden (Metal), Enigma (New Age), Rush (Rock) and Dave Koz (Jazz) – and all of these types and bands sounded great on the speaker with the equalizer off on my phone. If I enabled the equalizer, it improved things but only marginally. In other words, it sounds great on its own without any equalizer assistance. Having used the iClever BTS04 wireless speaker daily for the last week, I have no hesitation recommending this product. The sound quality is what you really buy these type of accessors for and this solution from iClever doesn’t disappoint. It is excellent across all types of music plus you have the added benefits of a great industrial design, splash resistance and long battery life. It does take a little bit of getting use to on the control buttons for changing tracks and the volume but once you get the hang of it, it is no big deal.